Obituary – Parks, Betty Jean (Chapman) « Perry High School Alumni Association, Inc.
Mrs. James A. 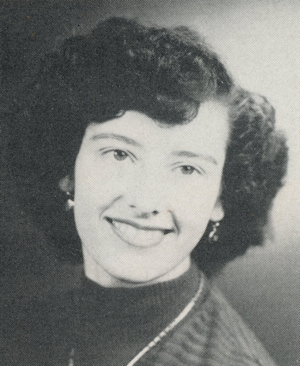 (Betty) Parks, 25, a 1955 graduate of Perry high school died at 4:38 p.m. Saturday in Enid General hospital a few hours after giving birth to twin sons. Services are at 4 p.m. Monday in the First Methodist church of Perry, with Rev. R. C. Veirs, pastor, officiating. Burial will be in Grace Hill cemetery under direction of Parks funeral home. Mrs. Parks, daughter of Mr. and Mrs. W. W. Chapman, 1115 Fir avenue, was born June 21, 1937, in Hominy, and moved to Perry with her parents in 1951. She was married May 28, 1954, in Pawnee. Her husband is an employee of the Halliburton Co. They had made their home in Enid the past several months. In addition to her husband, infant sons and parents, survivors are a brother, Bill Chapman, city police officer; and paternal grandparents, Mr. and Mrs. J. J. Chapman, Fresno, Calif.